Towering form of The Collector's castle makes a striking new addition to the skyline at Disneyland Resort in California. With a script overseen by the Guardians movies’ director James Gunn, Guardians of the Galaxy – Mission: BREAKOUT! is a triumph of storytelling and special effects that puts you at the centre of a Marvel story says Daniel Down. Even the hardiest of thrill seekers – your skydivers, your bungee jumpers – can’t fail to lose control of their larynxes at Disneyland Resort in California’s latest: Guardians of The Galaxy – Mission: BREAKOUT! Yet here I am sitting a few spots away from a man who merely has a wicked grin spread from ear to ear, while I periodically giggle and scream for my life as we hurtle up and down a lift shaft. This is all taking place in the lair of a certain Taneleer Tivan, a menacing character known as The Collector played by Benicio del Torro in the Marvel Studios blockbuster. The cool, collected man across from me happens to be senior Disney Imagineer Joe Rohde – and he designed this thing no less. “Did it take you long to put it all together?” I had asked him in The Collector’s private office at the base of the tower as we waited for it all to begin. “No, super fast… super fast, like a year,” he replied with a gleam in his eye. You see, the structure of the attraction was already in place – the old Tower of Terror, which is still making people scream in its original carnation over at Walt Disney World Resort in Florida. All Rohde and his team of Imagineers had to do was weave the Guardians of the Galaxy narrative through it, bringing it to life as a daring rescue attempt of the Guardians themselves from the clutches of The Collector, and convert the old tower into a gleaming alien structure full of strange artefacts. So not much then. I didn’t have long to question Rohde before the Guardians’ Rocket Raccoon appears at the top of a shelf of treasures, interrupting a message from The Collector to tell us how we’re going to help his teammates escape. Rocket is a marvel of animatronic engineering, moving and talking with an eerily lifelike quality; this is advanced stuff. The office where he’s explaining all this is littered with visual treats from the Marvel Cinematic Universe, as was the atrium we passed through to get here: Cosmo the dog, helmets from Thor’s enemies and a weapon from Dr Strange – it ties it all in with Marvel’s massive cinematic universe. It’s time to get on with the mission, but not before a few more wise cracks from Rocket, and he almost forgets picking up a familiar–looking Walkman belonging to Star-Lord no less, that sets the scene with Guardians of the Galaxy’s signature ’80s soundtrack. A door opens and we’re in the bowels of The Collector’s castle – again, props litter the place and Marvel aficionados will be playing ‘I spy’ throughout the meandering path that leads to an industrial service elevator where the tour of Tivan’s collection will commence. Rocket is going to hitch a ride atop the elevator and shut down the power releasing all the living trophies – including the Guardians. We’re helped into our seats by one of Tivan’s servants and we’re soon watching Rocket disable the generator, which sends things out of control. We’re off, straight up into the tower at what seems a 100 miles per hour. Cue much screaming; we hurtle up several floors, drop a few and watch the generator explode. I have seconds to notice that when the ride arrives at a level it’s not fully in line with the floor’s surface – I suspect a trick to make you think the thing really has malfunctioned. The Guardians are breaking out – on one floor Drax, free from his cage, wrestles an enormous beast; we watch Star-Lord and Gamora flee some of Tivan’s security drones. At one point we shoot right to the top and look out over Anaheim through a gap in the tower. A few more freefalls and the Guardians have successfully escaped and the whole team, including the achingly cute Baby Groot, waves us off and thanks us for breaking them out. 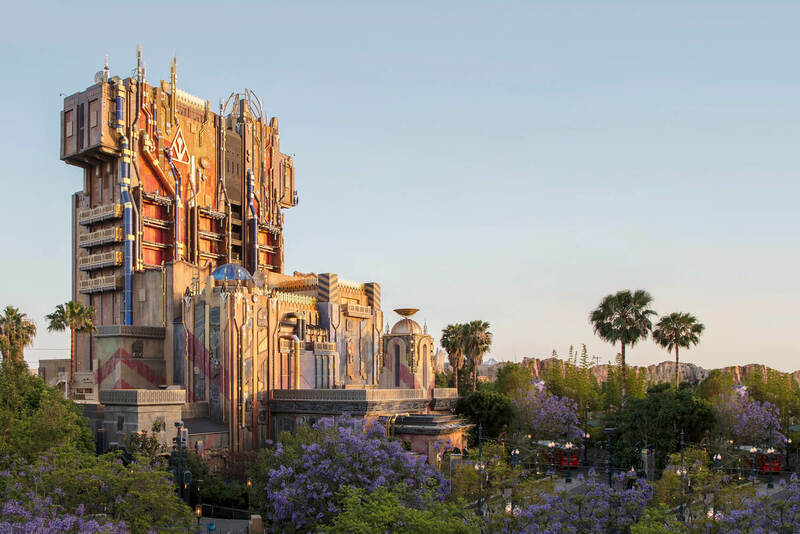 With six different scenarios that play out you’ll want to go on Guardians of The Galaxy – Mission: BREAKOUT! a good few times to sample as many as possible – if your stomach can take it. Indeed, you may find yourself a prisoner of The Collector, unable to leave his clutches owing to the delirious fun to be had here. I looked for Joe Rohde afterwards but couldn’t see him – then there he was, standing at the entrance to the tower, in line ready to have another go. There are loads of benefits to staying at an official Disney Resort Hotel, but our favourite is the Extended Theme Park Hours – Enjoy Extra Magic Hours, which gives hotel guests access to select attractions at one Theme Park each day. We also love the Midday Breaks, which give you the chance to return to your hotel to take an afternoon nap or relax by the pool before returning for more magic after the sun sets!